The critical tepidness to this picture is disappointing to me, the newest Hobbit film a natural extension to The Lord of the Rings trilogy is in fact a better film than any of the three original, critically acclaimed, and Oscar winning films. Peter Jackson miraculously manages to find the same pulse of the original series but hangs his startling visuals and impeccable fantasy action filmmaking skills onto a stronger and more accessible story as well as casting his characters with stronger actors. A book ending framework featuring Ian Holm as the older Bilbo opens the film. And features a cameo from Elijah Wood as good old Frodo, he hasn't aged a day. It's a storybook-style flashback structure, Bilbo telling his life's story before giving up his ring to Frodo at the beginning of the Fellowship of the Ring. What a tantalizing start to a rich adventure film. In the past we see the beginning of Bilbo's journey from a meek unassuming home body who gets roped into joined an expedition of trolls across Middle Earth to claim their rightful home, taken from them by a malicious dragon. The aw-shucks characterization of the four principal Hobbit of LOTR always had a bad taste in my mouth. His time there's only one hobbit and he's played by the immensely more interesting actor Martin Freeman, who exerts the same natural humbleness of Frodo but with a maturity missing from Elijah Wood's boyish wide-eyed performance. 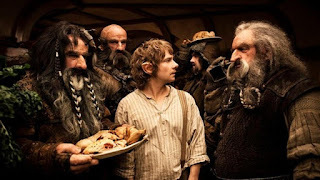 The dwarves who follow Bilbo and Gandalf are also less individual characters than a collective not unlike say, the seven dwarfs or equivalent grouped followers. By the leader, Thorin, is a well spring of character, an angry tortured soul, burdened by the death of his revered father but left being a king without a kingdom and meaning for his life. And as played by relative unknown Richard Armitage under heavy make up and special effects shrinkage becomes a wonderful brooding antihero. Jackson admirably take time with his narrative, arguably spending a bit too much time getting the heroes on their journey and squeezing in a few too many flashback detours. It all seems to aid in padding the running up to 'epic-status length. Oh well. When you knowing the running time before settling down in your seat it's all more than palatable. Once on the journey the set pieces and challenges, triumphs and setbacks along the way are every bit as thrilling as anything in the old series. But The Hobbit succeeds on two levels, as mentioned, creating the stand alone epic adventure in the present but also foreshadowing the events of The Lord of the Rings, the spectre of Saron the dark force in search of his one ring to rule them all as well as the ominous fate of Gandalf the Grey and his monumentous dragon battle in Fellowship of the Ring. Unfortunately, though the film is a massive monetary success, vocal critics knocking the jhigh-frame rate issue, the running time issue, the issue of stretching out of the original book into three films, and sadly even the disappointment of Jackson's previously films have made Jackson and the Hobbit a punching bag of sorts. What a shame, because the fact is The Hobbit: An Unexpected Journey is legitimately one of the best films of the year, and thus has me avidly waiting for the next two films.